This section contains information about the North Australia Railway (NAR). The NAR ran from Palmerston (Darwin) in the north to Pine Creek in south. It was 234km (145 miles 78 chains) long, opened on 1.10.1889 and officially closed 14.2.1981. The NORTH AUSTRALIA RAILWAY was the name given to the Northern Territory 3 ft. 6 in. gauge railway that extended south from Darwin to Birdum. The South Australian Government commenced this line, known then as the Palmerston to Pine Creek Railway, and opened it in 1889. 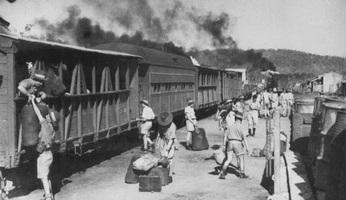 When the administration of the Northern Territory passed from South Australia to the Commonwealth Government on 1 January 1911 the railway was transferred to Commonwealth ownership, under the control of the Administrator of the Northern Territory. At this time it was known as the Northern Territory Railway, but was transferred to the control of the Commonwealth Railways Commissioner in 1918. Prior to this date the Commonwealth Railways seemed to have exercised a large influence over decisions about the railway, as well as providing some locomotives and other rollingstock. It was renamed the North Australia Railway in 1926 and extensions to Birdum were completed in 1929, but during and following World War II the effective railhead was Larrimah, a few miles north. The railway gained increased importance in the 1960's and early 70's through the haulage of iron ore from the Frances Creek deposits, about 140 miles south of Darwin. Ore traffic exceeded one million tons per annum, but unfortunately world ore prices dropped forcing the mine to close and other traffic was not enough to justify keeping the railway open. The line eventually ceased all operations in 1976. 11.1972 Major collision between ore train and NJ engines in yard.